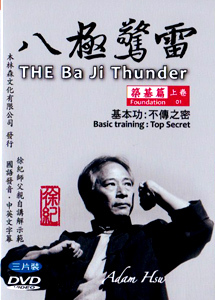 We are happy to announce a price drop on the monumental first series of Baji Thunder from Sifu Adam Hsu. The price on the 7-DVD set (over 8 hours long) will drop from $210.00 to $195, with the Plum price of $185. And all orders received before the start of Chinese New Year (February 8) will enjoy an even lower price of $175. This piece is excerpted from a longer article by Adam Hsu published in Lone Sword Against the Cold, Cold Sky. He begin by “showing Baji’s credentials” in a fascinating congruence of political animosities and defensive similarities… And in writing this he gives some insight into his own teacher, Liu Yun Chiao. Baji Thunder, Here At Last! 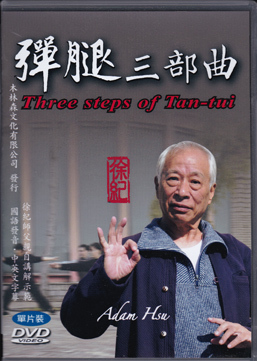 Anyone not stamping his feet in anticipation of this 7 DVD set from Sifu Adam Hsu on Baji Thunder, is probably not a Baji practitioner…at least, not yet. This comprehensive offering is so detailed and thorough, it will remind you of only one experience in your martial career: the indescribable treasure of working with a master teacher, in person. Whether you practice Baji Quan now, or have always wanted to learn, there is now an authentic path to this fierce and elegant Tiger and Bear style. Baji Quan is becoming popular right now. As often happens with newly popular subjects, people expect to conveniently find it wherever they go, so they can learn it. But there are only a few top-notch teachers who really know and understand Baji, and Adam Hsu is one of them, if not the main one. 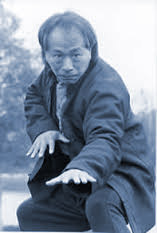 By all accounts his grandteacher, Li Shu Wen, was the best of this style’s practitioner. This is an exhaustive presentation of seven DVDs covering everything from famous masters to how to work the Baji multiple posts. More like a whole course in Baji than just some lessons, this big series is probably the equivalent of two or three months school tuition, but at least a year of training. Like the best of all these presentations, Adam Hsu wants you to learn Baji Quan. Here is a special interview we flew to Taiwan to capture. 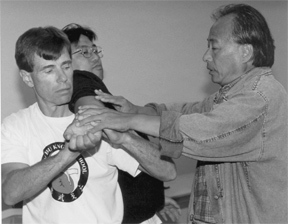 Hsu Sifu (teacher Hsu) takes on so many questions from Ted that this should be titled “Adam Hsu: 101.” Check out the first two sections where Adam Hsu discusses the true art of Kung Fu. Want to watch on this site? 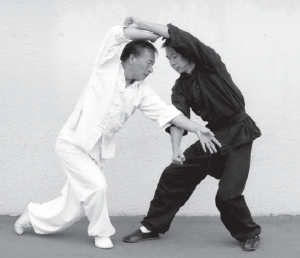 Much earlier in his career, Adam Hsu Sifu created a special series of three linking sets. Each of these were progressively designed to waste as little time as possible, getting that crucial fundamental information to the students. For instance, there are no repetitious sections. Also, each movement is a crucial basic. Two of these sets are now in a great series of children’s books created in Taiwan. The text is Chinese but the layout and presentation will appeal to most everyone. The first two forms are presented (the middle volume is a child’s graphic novel about Kung Fu) with beautiful graphic details. Although the format is illustrated, as though for a children’s comic, the actual information will benefit a student of any age looking for those crucial foundational Long Fist routines. This presentation discusses how Tan Tui can be made more “fightable.” Demonstrations of ways to alter the form are mixed with lectures on principles in Kung Fu, all of which makes a new contribution to Adam Hsu’s goal of rescuing the core of Chinese martial arts from a thicket of misinformation and lost skills. 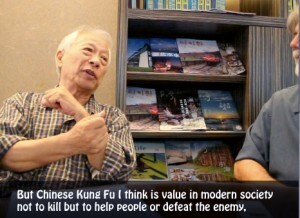 From Travis Rath’s review of Shifu Hsu’s Xing Yi Quan DVD series. Read the rest of the review on Kaimen. We have just completed, tentatively, the first collection of martial arts magazine covers featuring Adam Hsu. We’ve probably missed another dozen but its a good start, and fun to see. Click to get the tour, bring your Elk Horn Knives.